Since 1972, Art Castings of Colorado has been the trusted choice of artists around the country and around the world. We have a reputation as one of the cleanest, most efficient bronze art foundries in North America, and we’ve earned the confidence of scores of artists who rely on us for exceptional quality and service year after year. Loveland is a thriving arts community uniquely decorated with an enormous variety of wonderful bronze sculptures throughout the city providing the ideal creative environment for artists and many of Art Castings’ long term customers. Art Castings of Colorado was started in 1972 and operated out of a 2,500-square-foot building that has now grown to more than 25,000 square feet at 511 8th St. SE. This facility is home to our full-service bronze foundry, including operations and administration. Art Castings of Colorado is committed to provide all employees and artists with the tools and ability to create a safe and healthy work environment. In September of 2008, Art Castings became one of three foundries in the U.S. to receive OSHA’s SHARP certification. SHARP (Safety and Health Achievement Recognition Program) is an OSHA certified safety program that recognizes companies that integrate safety from top to bottom. 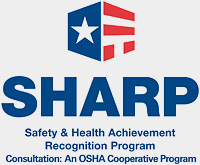 Read more about the Safety and Health Achievement Recognition Program (SHARP) here.